Was there ever life on Mars? 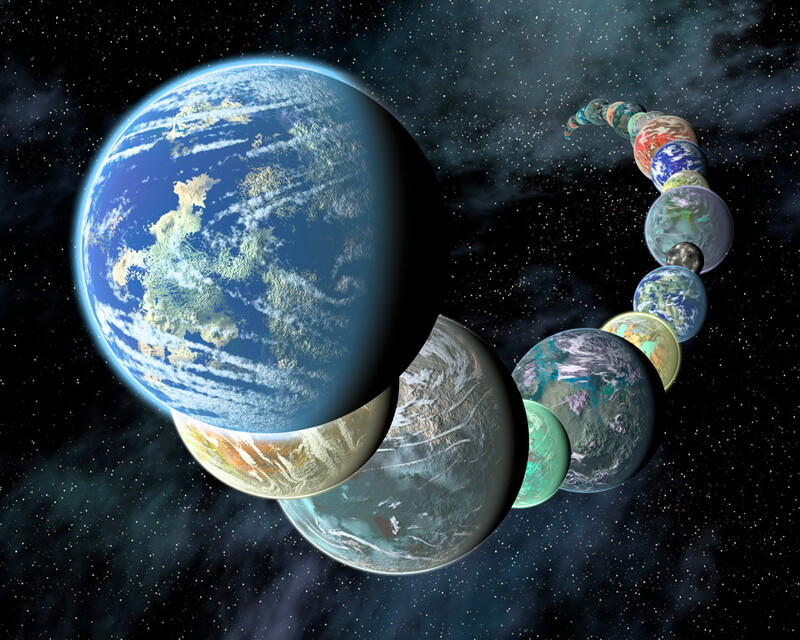 That is one of the longest-running and most debated questions in planetary science, and while there have been tantalizing clues, solid evidence has been elusive. Now there is a new piece to add to the puzzle, which may be one of the most interesting yet. As first reported on Smithsonian.com, odd formations composed of silica seen by the Spirit rover, nicknamed “cauliflower” for their shapes, may have been produced by microbes, new research suggests. 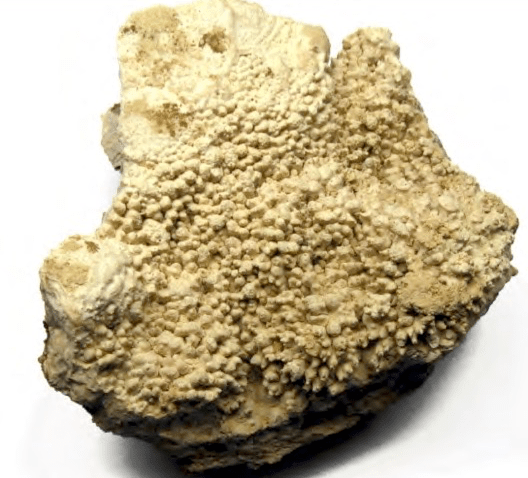 They are very similar to some silica formations on Earth which are found in hydrothermal environments and are known to have formed with the help of microscopic organisms. The formations were first seen by the Spirit rover in 2008 in Gusev crater, and analysis of the data obtained has continued since then, even though Spirit became stuck in sand in 2009 and was last heard from in 2010. At first, these formations of opaline silica and other evidence pointed to past hydrothermal activity in this region, perhaps even hot springs. They were found close to the Home Plate rock outcrop, which itself was once part of a hydrothermal system, scientists now think. At the very least, the discovery indicated the region was once geologically active, with lots of water. On Earth, similar environments are teeming with microbes. But what about Mars? The silica formations, also called “micro-digitate silica protrusions,” are very similar in appearance to ones found in the Atacama Desert in Chile, Yellowstone National Park in Wyoming and the Taupo Volcanic Zone in New Zealand. The ones in Chile are found primarily in the El Tatio region. It’s already known that microbes sculpted the formation in Wyoming and New Zealand, and are suspected of creating the ones in Chile as well. The new research was presented at the American Geophysical Union meeting last month by Steven Ruff and Jack Farmer from Arizona State University. The abstract of their paper is available here. “Opaline silica outcrops and soil identified by the Spirit rover adjacent to ‘Home Plate’ in Gusev crater are associated with a suite of geologic features that demonstrates that they are the products of a volcanic hydrothermal system, the first such example verified on Mars. Fumarolic acid-sulfate leaching of basaltic precursor materials was suggested as the origin of the opaline silica, based largely on geochemical arguments. A more complete analysis by Ruff et al. included stratigraphic and textural observations of the outcrops to advance the hypothesis of a hot spring and/or geyser-related origin under alkaline-neutral conditions; acid-sulfate leaching appears much less tenable. But the nodular expression of many of the outcrops and sub-cm-scale “digitate protrusions” they contain remained enigmatic, precluding a complete explanation for the silica. Now, new observations of silica deposits produced in small discharge channels from hot springs and geysers in a high elevation geothermal field known as El Tatio in the Atacama Desert of northern Chile reveal remarkably similar features, including infrared spectral characteristics and what we describe here as micro-digitate silica structures. The Atacama Desert is one of the driest places on Earth, and is often used by scientists as a comparison with Mars. Both the soil and climate are similar to what is found on Mars: it rains less than 100 millimeters per year, the temperature can range from -10˚C to 45˚ C (-13° F to 113° F) and the relatively thin atmosphere, at 13,000 feet elevation, allows more ultraviolet light from the Sun to hit the ground. It’s not a perfect analogy, but it’s pretty good, about as close as we can get on Earth. “I don’t think there is any way around using modern Earth analogs to test where Martian microbes may be found,” Kurt Konhauser of the University of Alberta and editor-in-chief of the journal Geobiology, told Smithsonian.com. There isn’t a lot of animal or planet life in the Atacama Desert, but microbial life thrives. 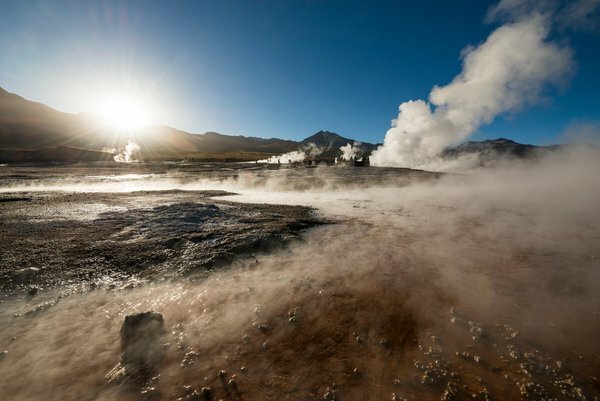 In the El Tatio region, there are more than 80 hydrothermal geysers, making it similar to Home Plate on Mars. The silica formations found here are very similar to those in Wyoming and New Zealand. In both those cases, microbes are known to have helped create the “fraternal cauliflower” shapes. 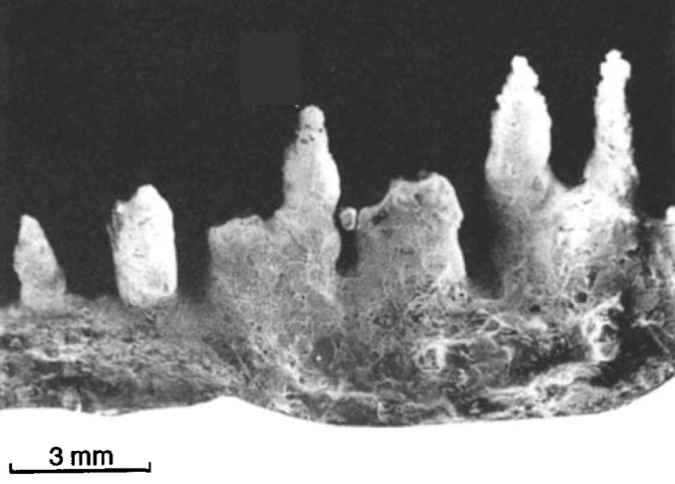 And if microbes were involved in all of these formations on Earth, what about their Martian counterparts? The possibility is exciting, but caution is always warranted. “Having worked on modern hot springs, I have seen all forms of structures that look biological but are not,” Konhauser told Smithsonian.com. Silica can come from non-biological processes and water, geography, wind or other environmental factors can then shape it into complex structures. “Because it looks biological doesn’t mean it is,” he said. More study will be needed to try to rule out non-biological processes. Unfortunately Spirit can no longer study these features, but there is still all of the data it sent back while it was still roving. “Only when something that we have identified as a potential biosignature is proven to have been produced only by life, and not by any abiotic means, can we make the claim that definitive evidence for life has been found,” Sherry Cady of the Pacific Northwest National Laboratory in Richland told Smithsonian.com. She is also a member of the NASA Astrobiology Institute. “I would certainly like to see some of those samples brought back,” she added. That may be a possibility. Gusev crater is listed as one of the potential landing sites for the upcoming 2020 Mars Rover, which will collect samples for later return to Earth. Maybe it could pick some cauliflower while it’s there? Another excellent overview, ‘Gusev Crater: A Geologically Diverse, Engineering Safe Site with Evidence for Past Habitable Environments and Potential Biosignatures,’ can be found here. 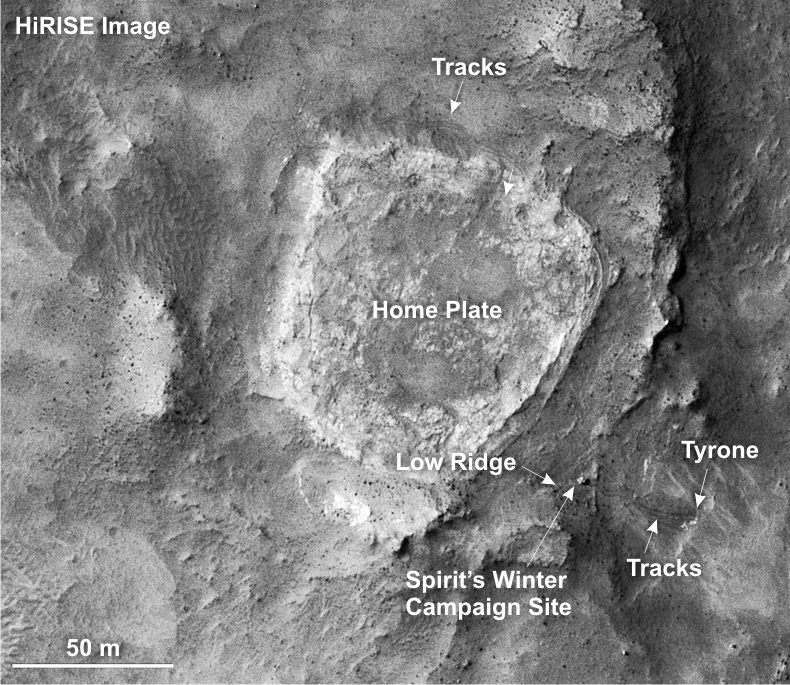 Spirit landed in Gusev crater on Mars on Jan. 4, 2004, and continued exploring until it was last heard from on March 22, 2010. Gusev crater was thought to have once been an ancient lake. While little evidence for that was found on the crater floor itself, plenty of evidence for past water activity, including the hot springs, was found in the hills near the landing site. As also recently reported, analysis of Spirit data has shown evidence for acid fog on Mars, another indication of past volcanic activity in this region. 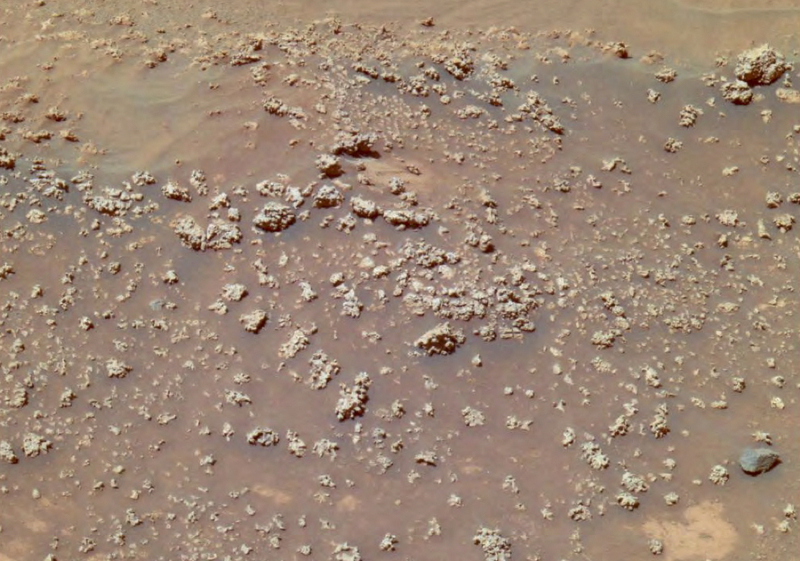 The findings are also interesting in relation to a previous study done by noted geobiologist Nora Noffke last year, who reported possible evidence of microbial mats in images sent back by the Curiosity rover in Gale crater. 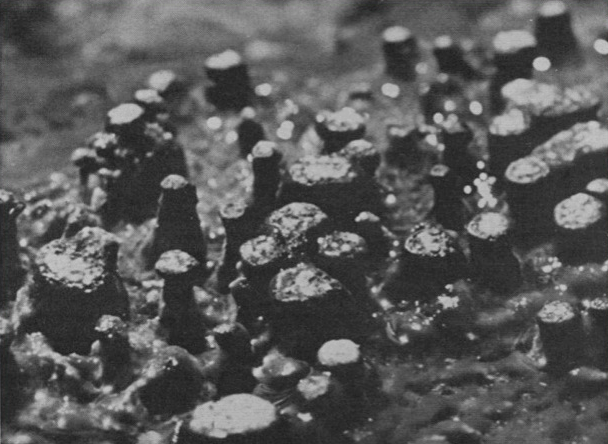 While not exactly the same as the formations found by Spirit, the features seen are also reminiscent of other kinds of microbial activity which are common on Earth. 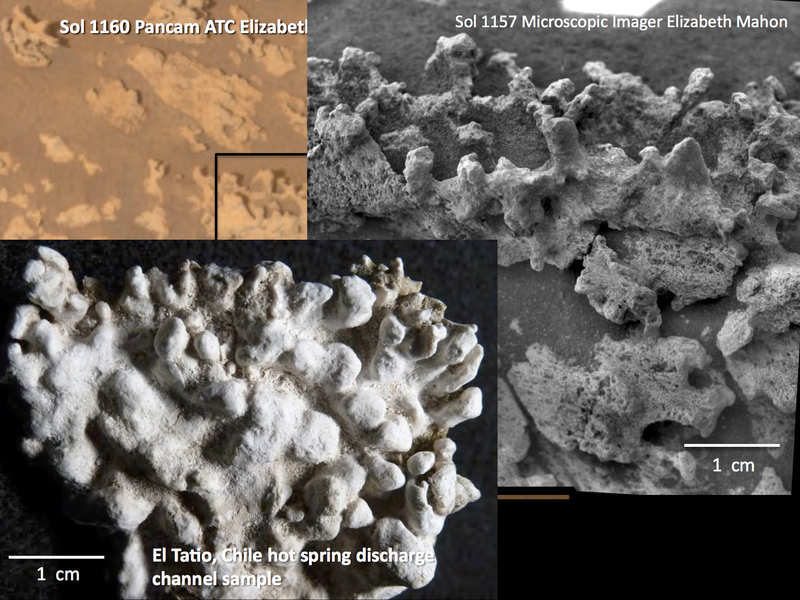 While not proof of past life on Mars yet, these silica “cauliflowers” may just be some of the best evidence found so far. What is Chris McKay’s take on this? If I remember correctly, Noftke’s paper was the FIRST AND ONLY “Mars life” paper he ever published in his own astrobiology journal, because of the EXQUISITE DETAIL of correlating features on Mars and Earth she presented as evidence. I remember him stating something akin to ” I do not publish a claim of past Mars life just because some one thing on Mars appears to be very similar to a microbially produced thing on Earth”. Would he have accepted this paper if it was submitted to his journal INSTEAD of the journal it WAS submitted to? If so, I will start to get VERY EXCITED about it! RSVP.